Maybe it’s confirmation bias because we’re an Apple-centric site and almost everyone we know uses Macs, but it seems just about every startup these days uses Macs and Apple gear. Who can blame them? The resolutions are close aren’t they? What is the Macbook Pro sitting on? Nice wallpaper. Could you please give it away? > What is the Macbook Pro sitting on? I use one as well. They are excellent. Are you sure that is what the Macbook Pro is sitting on? 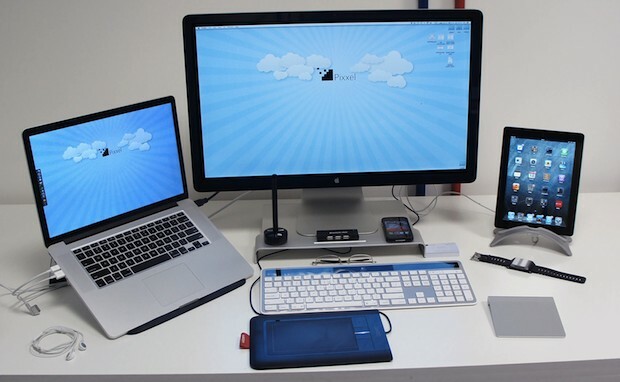 Not the Thunderbolt Display? Looks like a Logitech Alto Express. Pretty expensive for the purpose. I have the 750 as well. Great keyboard. Awesome setup! I’m hoping my next setup will be similar with a MBP/Air and ATBD to go along!! Great Thread and very cool share! !